BLAKE2 is specified in RFC 7693, and our code and test vectors are available on GitHub, licensed under CC0 (public domain-like). BLAKE2 is also described in the 2015 book The Hash Function BLAKE. BLAKE2 includes the 4-way parallel BLAKE2bp and 8-way parallel BLAKE2sp designed for increased performance on multicore or SIMD CPUs. BLAKE2 offers these algorithms tuned to your specific requirements, such as keyed hashing (that is, MAC or PRF), hashing with a salt, updatable or incremental tree-hashing, or any combination thereof. These versions are specified in the BLAKE2 document. BLAKE2 also includes the BLAKE2x variants, which can produce digests of arbitrary length. BLAKE2x is specified in a separate document. BLAKE2 shines on 64-bit CPUs: on an Intel Core i5-6600 (Skylake microarchitecture, 3310MHz), BLAKE2b can process 1 gibibyte per second, or a speed rate of 3.08 cycles per byte. blake2.pdf is our original BLAKE2 documentation, which describes how we went from the SHA-3 finalist BLAKE to BLAKE2, how all the BLAKE2 versions work, and analyzes BLAKE2's performance and security. The b2sum utility is similar to the md5sum or shasum utilities but for BLAKE2. The archive b2sum-bin_20130305.zip provides fat binaries of b2sum for Linux and Windows, 32-bit and 64-bit. BLAKE2 is based on the SHA-3 proposal BLAKE, designed by Jean-Philippe Aumasson, Luca Henzen, Willi Meier, and Raphael C.-W. Phan. BLAKE2, like BLAKE, relies on a core algorithm borrowed from the ChaCha stream cipher, designed by Daniel J. Bernstein. You may contact us on Twitter if 140 characters are enough and if a public discussion is okay. Otherwise, please email us to [email protected], which forwards to the four designers. We created a mailing list for BLAKE2 discussions (security, performance, bug reports, etc. ): to subscribe, please send an empty message to [email protected]. 2018 Jun 13: Nazar Mokrynskyi. blake2.wasm. 2018 Jun 4: Jack O'Connor. blake2_c.rs. 2016 Sep 25: dcposch. blakejs. 2016 Aug 25: Minio Cloud Storage. blake2b-simd. 2016 Jan 31: Pol Le Garsmeur. java-blake2s. 2016 Jan 5: ScorexProject. scrypto. 2015 Dec 5: John Galt. blake2. 2015 Nov 9: Cesar Eduardo Barros. blake2-rfc. 2015 Oct 31: Coda Hale. blake2. 2015 Jun 9: Ivan Kozik. node-blake2. 2015 Jan 30: Markku-Juhani O. Saarinen. blake2_mjosref. Main result: "A clean & simple implementation of BLAKE2b and BLAKE2s hash functions -- written while writing the RFC." 2014 Aug 27: Michael Gehring. rust-blake2. 2014 Aug 4: C. J. Silvero. avon. 2014 Feb 14: Joubin Houshyar. Blake2b. 2013 Dec 16: Larry Bugbee. blake2_py. 2013 May 10: Floodyberry. blake2b-opt. 2013 Mar 27: Dmitry Chestnykh. pyblake2. 2013 February 9: Tasuku Suenaga. Digest-BLAKE2-0.01. 2013 Feb 3: Dmitry Chestnykh. blake2-dart. 2013 Jan 14: Corey Richardson. libblake2. 2013 Jan 7: Ulrik Sverdrup. blake2-ppc-altivec. 2013 Jan 6: Takashi Seki. node-blake2. 2013 Jan 3: Dmitry Chestnykh. b2sum in Go. 2012 Dec 30: Kwon-Han Bae. python-blake2. 2012 Dec 29: Dmitry Chestnykh. blake2s-js. 2012 Dec 29: Dmitry Chestnykh. blake2s. 2012 Dec 24: Craig Akimoto. php-blake2. 2012 Dec 22: Dmitry Chestnykh. b2sum. 2012 Dec 22: Dmitry Chestnykh. blake2b. 2015 May 28: Thomas Espitau, Pierre-Alain Fouque, Pierre Karpman. Higher-Order Differential Meet-in-The-Middle Preimage Attacks on SHA-1 and BLAKE . IACR ePrint archive, report 2015/515. 2015 Feb 9: Dmitry Khovratovich, Ivica Nikolic, Josef Pieprzyk, Przemyslaw Sokolowski, Ron Steinfeld. Rotational Cryptanalysis of ARX Revisited. IACR ePrint archive, report 2015/095. 2014 Dec 18: Yonglin Hao. The Boomerang Attacks on BLAKE and BLAKE2. IACR ePrint archive, report 2014/1012. 2013 Jul 29: Jian Guo, Pierre Karpman, Ivica Nikolic, Lei Wang, Shuang Wu. Analysis of BLAKE2. IACR ePrint archive, report 2013/467. Q: Where are test vectors? Q: How can I be sure the BLAKE2 is secure? A: We have no proof that BLAKE2 is as secure as we claim, but there are good reasons to believe it: BLAKE2 relies on (essentially) the same core algorithm as BLAKE, which has been intensively analyzed since 2008 within the SHA-3 competition, and which was one of the 5 finalists. NIST's final report writes that BLAKE has a "very large security margin", and that the the cryptanalysis performed on it has "a great deal of depth". The best academic attack on BLAKE (and BLAKE2) works on a reduced version with 2.5 rounds, whereas BLAKE2b does 12 rounds, and BLAKE2s does 10 rounds. But even this attack is not practical: it only shows for example that with 2.5 rounds, the preimage security of BLAKE2b is downgraded from 512 bits to 481 bits, or that the collision security of BLAKE2s is downgraded from 128 bits to 112 bits (which is similar to the security of 2048-bit RSA). Q: Why is BLAKE2 so fast? A: BLAKE2 is fast in software because it exploits features of modern CPUs, namely instruction-level parallelism, SIMD instruction set extensions, and multiple cores. BLAKE2 also benefits from the optimization work performed during the SHA-3 competition (see for example this paper by two of the designers of BLAKE2). Q: Why do you want BLAKE2 to be fast? 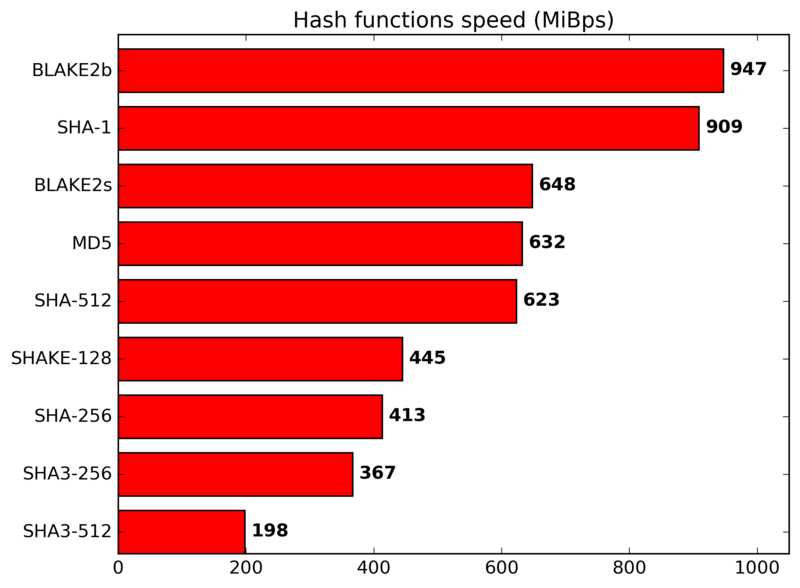 Aren't fast hashes bad? A: You want your hash function to be fast if you are using it to compute the secure hash of a large amount of data, such as in distributed filesystems (e.g. Tahoe-LAFS), cloud storage systems (e.g. OpenStack Swift), intrusion detection systems (e.g. Samhain), integrity-checking local filesystems (e.g. ZFS), peer-to-peer file-sharing tools (e.g. BitTorrent), or version control systems (e.g. git). You only want your hash function to be slow if you're using it to "stretch" user-supplied passwords, in which case see the next question. Q: So I shouldn't use BLAKE2 for hashing user passwords? A: You shouldn't use *any* general-purpose hash function for user passwords, not BLAKE2, and not MD5, SHA-1, SHA-256, or SHA-3. Instead you should use a password hashing function such as the PHC winner Argon2 with appropriate time and memory cost parameters, to mitigate the risk of bruteforce attacks—Argon2's core uses a variant of BLAKE2's permutation. Q: BLAKE2bp gives different results from BLAKE2b. Is that normal? A: Yes. BLAKE2bp is a different algorithm from BLAKE2b and BLAKE2sp is a different algorithm from BLAKE2s. Each algorithm produces a different hash value. BLAKE2b and BLAKE2s are designed to be efficient on a single CPU core (BLAKE2b is more efficient on 64-bit CPUs and BLAKE2s is more efficient on 8-bit, 16-bit, or 32-bit CPUs). BLAKE2bp and BLAKE2sp are designed to be efficient on multicore or SIMD chips, by processing the input in parallel. This parallel approach results in different secure hash values from the single-core variants. More generally, two instances of BLAKE2b or BLAKE2s with two distinct sets of parameters will produce different results. For example, BLAKE2b in some tree mode (say, with fanout 2) will produce different results than BLAKE2b in a modified tree mode (say, with fanout 3). Q: Which should I use? BLAKE2b, BLAKE2s, BLAKE2bp, or BLAKE2sp? A: A rule of thumb is that on 64-bit platforms the best choice is BLAKE2b, whereas on 32-bit (or smaller) platforms BLAKE2s is recommended. Or, you could try each of the four of them and see which one performs best on your deployment platform. If you do that, please write to us and let us know what you found. Q: The BLAKE2 documentation only describes differences with the original BLAKE, where can I find a complete specification? A: The RFC includes a complete specification of BLAKE2b and BLAKE2s (though not of the tree mode).